The Storm Code X continues the popular Code line of Storm bowling balls. This ball is the solid version of the Code Black and Code Red. The Code X features the R2S Solid Reactive coverstock that is wrapped around the RAD4 Core and is finished with a 3000 grit Abralon pad. This bowling ball offers more midlane read and performs well on heavy oil conditions. I was so excited when I read about the making of the Code X. Being a huge fan of the Code Black and Red and also loving the R2S solid cover, I couldn't wait. This ball is even better than I expected. Who wouldn't love a Code Black with an IQ Tour cover? I went with a 65*5*45 layout, my standard for almost all my first drills. My initial reaction to this ball when I threw it was that of excitement!! This ball just floats through the front part of the lane so effortlessly. The smooth continuation it has when it reads the middle part of the lane is nothing short of phenomenal. I threw about 6 games with it and as I moved left to stay ahead of the transition this ball never showed any signs of stopping. Its one of the best motions ive ever had from a strong asymmetrical piece. Compared to my SureLock it is not as early and rolly. It definitely continues more down lane but it doesn't handle heavy oil as well as the SureLock. It started up alittle too late when I threw it on a pattern that had aliitle more volume through the front part of the lane. This ball has yet to leave my bag since I drilled it. The NEW Storm Code X is a HOOK MONSTER....... Imagine an Alpha Crux on steroids........ That is the Storm Code X. I drilled mine with a 62X4 1/4x38, and hit it with 2000 abralon and reacta shine. Even with attempting to smoothen this ball out, it still comes off the spot HARD and was much more aggresive then I was expecting, but boy do I like it!!!! You will need higher volume or just longer patterns in general for this hook in a box to be your weapon of choice. I believe this ball should be a must in your bag if you have a lower rev rate and are looking for more help from the ball itself, and for those tournament bowlers who see those longer tougher patterns and are looking for that earlier traction type of motion. Go out and get your Storm Code X today! In the simplest terms, the Code X is the Alpha Crux reborn. LIke the Code Black and Code Red, it features the R2S coverstock, just in solid form. This is a weaker cover than the Alpha had, but the core is stronger, delivering more flare and overall torque, which provides the familiar roll, but in a vehicle that’s even more versatile. Due to the medium strength of the cover, it is usable on a wider range of conditions and is easier down the lane, also providing a bit more downlane shape than the Alpha. Compared to the Black and Red, the X is several boards stronger than both, as well as firmer on the backend than the Red, but not quite as sharp as the Black. The math is very simple on the Code X, R2S + RAD4 = X, which to me is one of the simplest yet most effective formulas in bowling. Can you say HOOK and HIT? For any and all of the Code series fans, you are going to love the release of the Code X. The Code X will tackle the heavier oil patterns so when they start breaking down you got the Code Red or Code Black to go to. I took the Code X to my practice center and bowled with it on a 40’ house shot on a synthetic lane surface. The Code X was amazing how well it rolled through the fronts without losing and energy, with an incredible mid lane read and unbelievable continuation through the pins. At box finish this ball clears the fronts as well as any. Even for an old guy, I had pin flying everywhere, even with a few scouts. So on the heavier patterns you’ve got a ball in the Code X that’ll get you through the earlier games until the pattern starts breaking down. The Code X will definitely in my bag for tournaments and heavier oiled house shots. This ball is going to be a great addition to all league bowlers and a must to all tournament bowlers. Drilled the Storm Code X and wow! This ball has been really special in my hand i have a hard time putting it down. I really liked my Alpha Crux and to see the same type of motion was something i was missing in my bag. The cover is weaker but with a stronger core made a big difference to me allows me to move left more and know this ball will still have energy down lane. If you like the code black and the code red you'll love this bag as a great heavy oil ball. I laid out my Storm Code X with a 40x4.5x60. My goal was to get a better mid-lane read on those heavier and longer patterns. I wanted a ball that was slower through the hook phase. Everything about this ball was spot on what I expected. Having thrown the Code Black and Code Red, the RAD4 core is just as predictable and controllable on the Code X. The 3000 Abralon surface did shine a bit as the frames and games added up. The initial aggressive motion you generally see with high friction surfaces began to tame a bit. That’s not to say it became ineffective. As the lanes transitioned, I was actually able to stay with the Code X longer than anticipated. It still pushed through the heads and recovered on the backends where other surface equipment might have sparked early or burned up. Like the Code Black and Red… Storm has hit another home run with the RAD4 core! With an intermediate differential that’s higher than any other ball in its line, the intuitive RAD4 Core provides pro shop professionals more fine-tuning possibilities for bowlers of all styles. At over 10% more midlane read than the Code Red, R2S Solid is a chassis that favors heavy oil. It’s a perfect marriage between cover and core machined to precise specifications to achieve optimal performance no matter the condition you throw at it. I was very happy to hear that a new “Code” ball was going to be released. The the Code X is the Alpha Crux on steroids. The Code X is the solid version of the Code Black and Code Red, which both had the R2S Coverstock as well. This ball has everything that the league-to-tournament bowlers could ask for… Hook & Hitting Power! This ball comes out-of-the box at 3000 Abralon, but can easily be changed to the surface desired. I have mine drilled with the pin one inch above the fingers and CG kicked out. On a THS this ball gets down the lane very well for a duller ball and still hits with authority. I was worried that I might have to shine it up a bit, but after seeing it in motion I will not be changing the surface. is an Alpha Crux with stronger motion down lane. I drilled mine 4 x 5.5 x 2 pin up no hole. I added Storm Step 2 on it and hit it with a light 1000 pad. I was fortunate to shoot 300 with it first game off the press. The Code x was a little cleaner than expected with a solid cover but still had plenty of midlane and great motion on the backend. The CODE X has been a big hit in our Storm Matchmaker events with all styles of bowlers. Another great addition to the Storm Line. 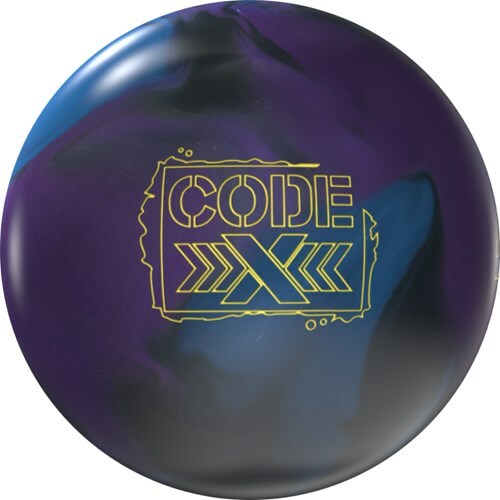 The Code X is the third installment in code series bowling balls within the Premier series from Storm. The Code X uses the Rad4 Core like the Code Red and Code Black but what sets the Code X apart is the Coverstock. The Cover stock is the legendary solid reactive R2S. The Code X wants to start out of my hand and motion big time in the mid-lane. I did not do any surface changes but the Code X will polish and be slightly more angular on the backend. The layout I used is very similar to the layout I used in a Sure Lock. The pin is over the bridge with the CG and Mass Bias kicked out with weight hole on mid line at 6 inches. The dual angle numbers are 40 X 5.5 X 45 and that is based off my pap which is 5 5/8 over and ¾ up, medium ball speed and rev rate around 300. I threw the Code X and Sure Lock on a fresh house pattern and I was surprised by how much and where the Code X Hooked! The motion reminded me of the Alpha Crux with a more powerful backend. The Code X allowed me to open up my angles and just hook it! The Sure Lock gave me slightly earlier hook but the backend suffered as I moved deeper into the lane. The Code X was just more powerful in the mid lane and on the backend. When everything was said and done I was a good arrow left with my feet compared to the Sure Lock and there was no quitting on the backend. I can see me using the Code X on tighter and / or longer patterns and have the confidence that the Code X was going to HOOK! The Code X definitely gave the Premier Line a big boost of Hook Power! The Code X is everything I’ve been waiting for. It’s got the IQ Tour Solid cover with the Code Series cores. I love my Code Black and Code Red but sometimes they’re a little too clean. Can’t handle the oil. Code X has no problem with that. Amazing performance. Rolls early and tips more than any solid ball I’ve ever owned. If you like the Code Balls or the IQ Tour, the Code X is a no brainer. The Storm CODE X is the latest Asymmetric ball added to the Premier Line. Using the lightweight RAD4 core and the proven R2S solid cover stock allows to add this to an already impressive line from Storm. I got to chance to demo this ball and then drilled one for myself shortly after that. Bowled on 45ft THS a few nights before my car accident, which is why this is a little delayed in getting reviewed by me. Since I am pretty close to a “spinner” I have my drilled with a 5 inch pin to help it get down the lane, which did help compared to my Sure Lock with a 3 ¾” pin layout. Did notice earlier and cleaner movement in the mid-point of the lane then a similar drilled CODE RED, but did save a good bit more energy in the back end for me then the SURE LOCK with notable better pin carry. Matching the core and cover was really a match made in heaven for any bowler that bowls in scratch tournaments and also heavy oil house conditions no matter what surface the lanes are. The Storm Code X is the newest Premier line ball for Storm and is the solid edition of the very popular Code series. The Code X contains the RAD4 Core and is covered by the R2S solid coverstock which is finished at 3000 grit matte. I drilled my Code X with my new favorite layout where the pin is 4 inches from my pap with the CG stacked below the pin. This gives me the ultimate control and I have now used it on my Intense, Hyper Cell Fuzed, and Dare Devil. The Code X is very strong. Even with the Shorter pin layout the ball still has a lot of pop and drives hard through the pins. The Code X for me is pretty comparable to the Code Red in that both reads the mid lane early but still has enough energy left to finish when playing from deeper angles. The Code X is just stronger than the Red by about 5 boards. This ball is a great addition to my bag. It's a solid with 3000 grit abralon. For me, it doesn't have that sharp break off the back end like the Black or the Red: it's a little smoother but still packs a punch. I generally just try and stay inside in the oil and stay away from the friction of the track area so the ball doesn't decide to hook up early on me. I have found that I can use this ball on a house shot but will usually have to put it away by the third game. This ball is very similar to the Alpha Crux in color scheme but the fragrance is an orange zest. This ball is available now. Go see you local pro shop professional today. Bowl up a storm. I drilled up my CODE X with a standard asym layout of mine, 65/5/35 with a weight hole 5" across the grip center. I have throw this box finish and then hit it with a 2000 pad to make it a little more earlier for a tournament with more head oil. This puts the pin above my ring finger with the RAD4 slightly right of my thumb. The CODE X is strong especially compared to some of my other balls that I prefer when there is more oil up front like my NO RULES EXIST or IDOL. Compared to the IDOL, my IDOL is much earlier and the CODE X is more on the back end. Compared to the NO RULES EXIST is a little tougher because I usually leave the NRE at 1500 abralon so naturally it is much earlier than the CODE X. They are good compliments in that progression of surface as when the NRE starts to ping or check too quickly, the CODE X is in play. Put this one in your bag if you want a ball for oilier lane conditions that has back end movement.